Home » Black on White Or White on Black? Black on White Or White on Black? There is no denial that zebras (scientific name is Equus quagga) are the most exotic and stunning among the horse species. Found mainly in the parts of Africa, genetics determine the variety of stripes in Zebra. Previously, it was believed that Zebras were white animals with black stripes. This notion was widely believed as a result of their underbellies, which is white in color. But, the studies done on them prove otherwise. Embryological evidence shows that they are born black. The white stripes and underbellies are additions because of lack of pigmentation those areas, as per the studies. The selective pigmentation is as a result of melanocyte skin cells. The presence of excess pigment, called melanin gives the species a dark complexion. Melanin is produced by the oxidation of amino acid tyrosine, followed by polymerization. The pigment is produced in a specialized group of ligaments and tissues, known as melanocytes. The determination of skin color in human beings is determined by the same cells. Unlike the Homo Sapiens species, the pigmentation in Zebra’s skin transfers to its fur. The pattern is subsequently due to pigment activation (black) and inhibition (white). 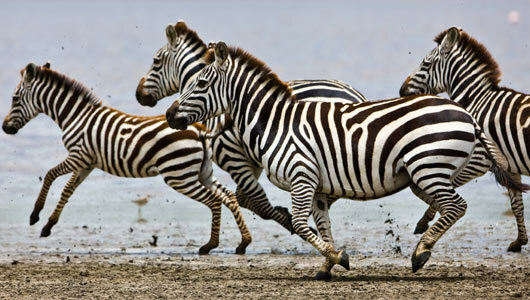 Therefore, black is the actual color of the fur of Zebra and the white patches are the areas that lack pigmentation. As per sources, zebras have dark skin beneath their fur. Tim added, the pattern or number of stripes is affected by the place that the Zebra’s live in. Those that live in warmer climates have more stripes because of melanogenesis. When the skin is too much exposed to UV radiation, skin gets visibly tanned as a result of melanogenesis. An effective absorber of light, melanin dissipates over 99.9 % of absorbed UV radiation. This is beneficial as it helps them to survive in the hot climates. When a hot current of air hits the Zebra, the air moves alternatively from black (light-absorbing stripes) to white. This alternating current creates little swirls of air that makes their skin temperate about 5.4 degrees cooler than their non-stripped mammalian counterparts. The bold stripes on the body of Zebra’s serve a lot of purpose other than keeping themselves cool. The stripes let Zebra’s camouflage themselves, thus helping in escaping from their predators. 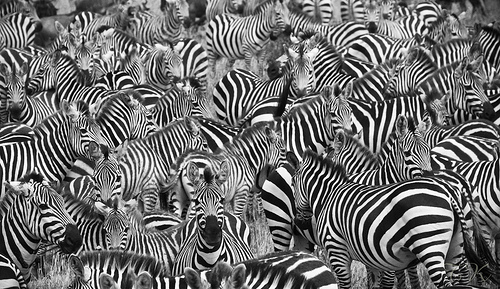 Usually travelling in herds, the stripes of one zebra blends in with the stripes of Zebras around it. This creates an optical illusion in the eyes of the predators. Hence, they cannot easily identify their prey and their attacking strategy is weakened. The information enlightened Joe’s curious mind and he decided to share this with his friends.